My family loves movie night. We get our coziest blankets, tubs of popcorn and snacks and settle in on the couch to watch a fun family friendly movie often. Well, the Minions movie is definitely a great movie to gather your family around to watch. 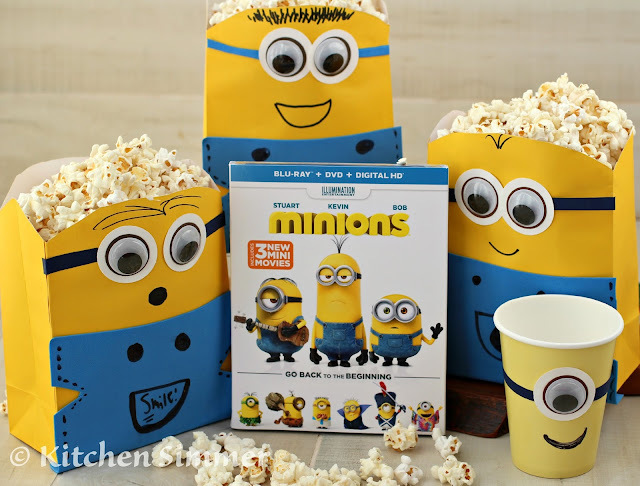 A fun way to make watching the Minions extra special is by throwing a minion movie party. You and your kids will have a great time making all the minion decorations and create some wonderful childhood memories in the process. My two kids are beyond excited because the Minions movie is now available on a Blu-Ray/DVD combo pack. They just adore Kevin, Bob and Stuart. We get to see the minions literally from the dawn of time. My son loves Kevin the best. Kevin is the leader of the group that sets out to help his minion family find their ultimate villain to follow. My daughter is simply in love with Bob. She thinks Bob is always doing something adorable. I have to admit, I think he is my favorite too. This movie is so much fun to watch and you will be laughing out loud right there with your kids from the beginning until the funny final credits. The great news is you can run out and buy the Blu-Ray/DVD combo pack now or order this Illumination Entertainment animation film fast and easy online. Check out this movie website: minionsmovie to find out where you can get your copy of the Minions © 2015 Universal Studios. All rights reserved. I love to throw a party and a movie party is especially fun because your theme is already set. Our theme for the Minions movie was... you guessed it... minions!! I had so much fun going to the craft and party stores to gather my supplies. The kids wanted to get in on the decorating so I had them help me make the minion popcorn bags and the special minion cups. We all like our own popcorn bag/tub when we watch a movie, so we made enough bags for the whole family. Step 1: Cut a curve at the top of the bag for the minion head. Note: My gift bag had handles so I cut the handles off at the same time. Step 2: Use scissors or a circle punch to cut out eyes using the white and brown paper. Step 5: Glue blue paper to the bottom of the bag to make the minion overalls and decorate as desired. 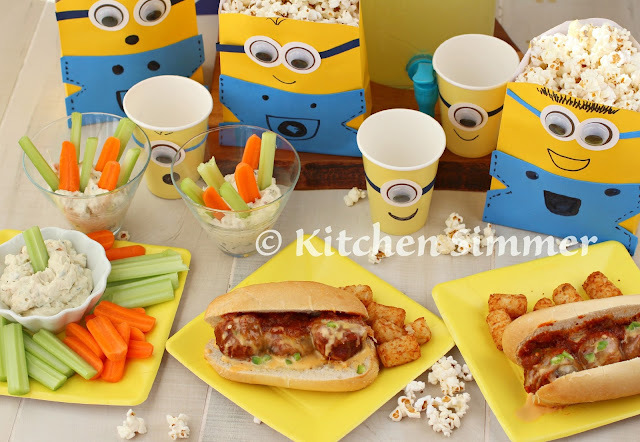 The food was really fun to play around with for the Minions movie. 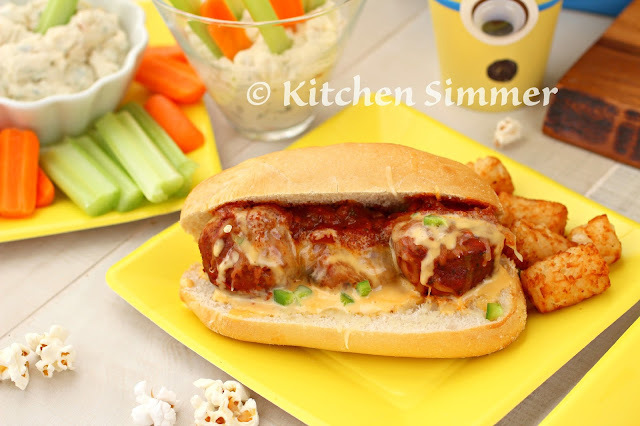 I decided to take a family favorite dish like meatball subs and make them extra special. 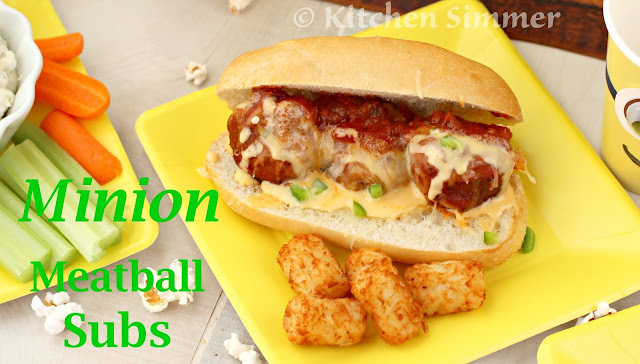 These meatballs subs have two types of cheese so they are really extra yummy. Directions: Soak bread and crumble. Then mix all ingredients together and form into large golf-ball size meatballs and saute in a frying pan on medium heat to brown. 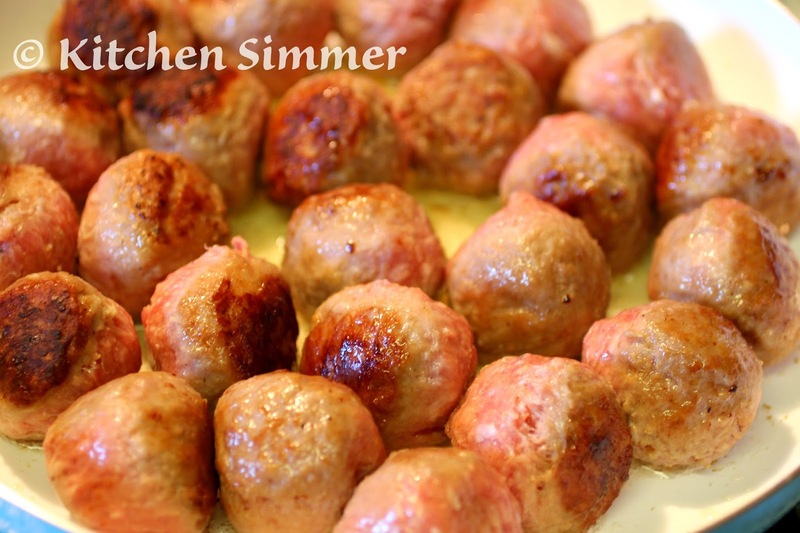 Meatballs will finish cooking in sauce. 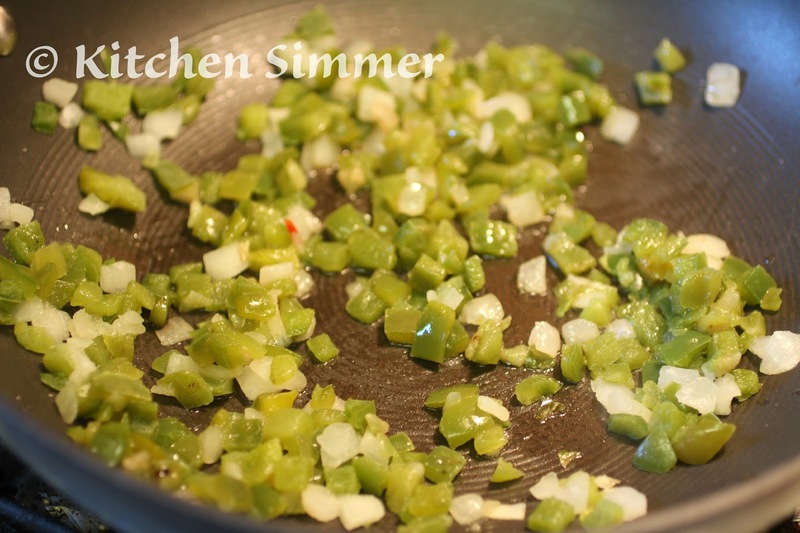 Saute green pepper and onions with 1 Tbs canola oil until they soften. 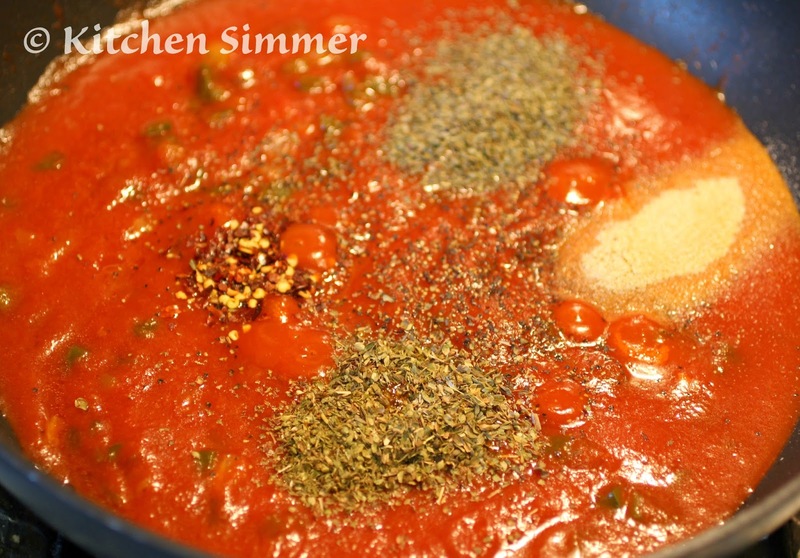 Then add the pasta sauce, dried spices and water. Tip: Rinse out pasta jar with water to get all of the tomato sauce. 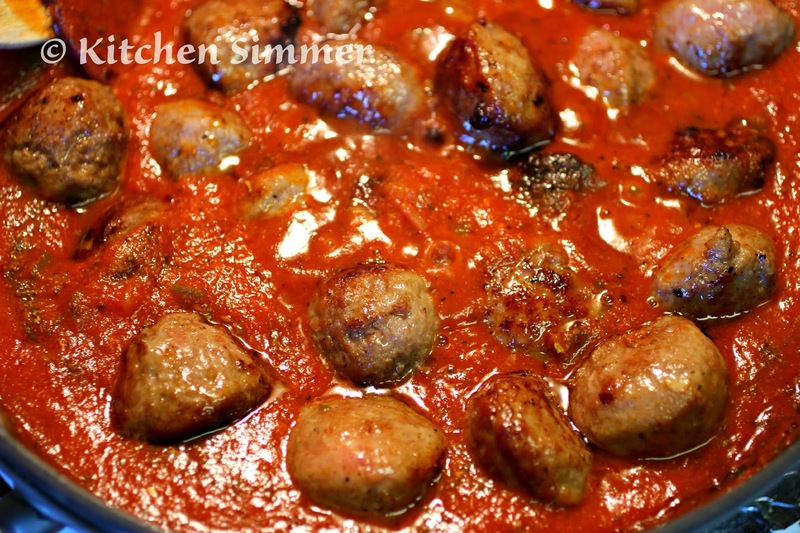 Add the browned meatballs to finish cooking in the sauce. Lower the heat to medium low and cook for 20-25 minutes with a lid on the pot. Stir occasionally. Taste for seasoning and turn off stove. Directions: Cook over medium low heat until fully melted. 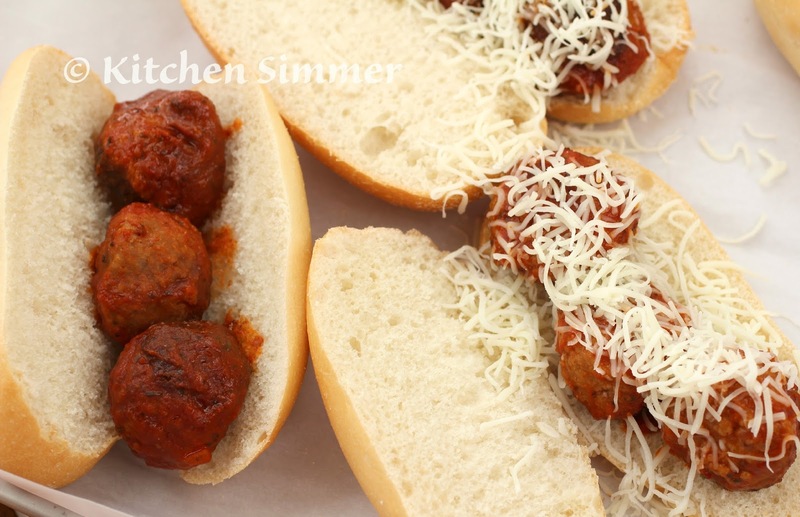 Cut rolls in half (leave one end attached) Fill with meatballs and sauce. 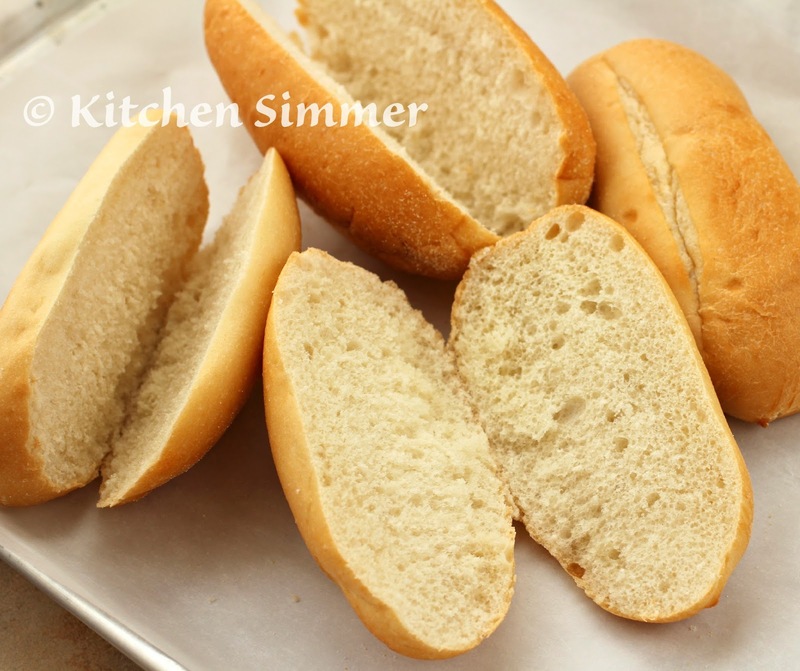 Top with a small handful of mozzarella cheese and bake in a 400 degree oven for 5 minutes or until cheese melts and the bread toasts slightly. 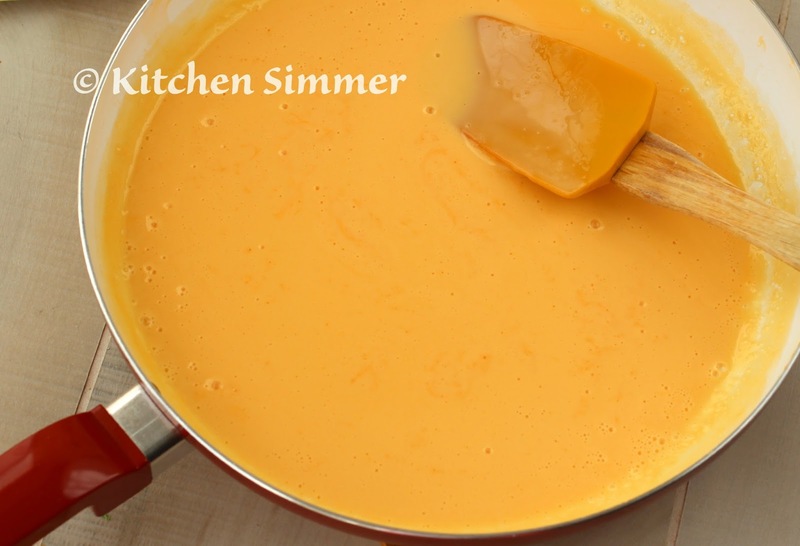 Then top with the melted yellow cheese and serve. Enjoy the subs hot. I always try to include some fresh vegetables to our meal or snacking. 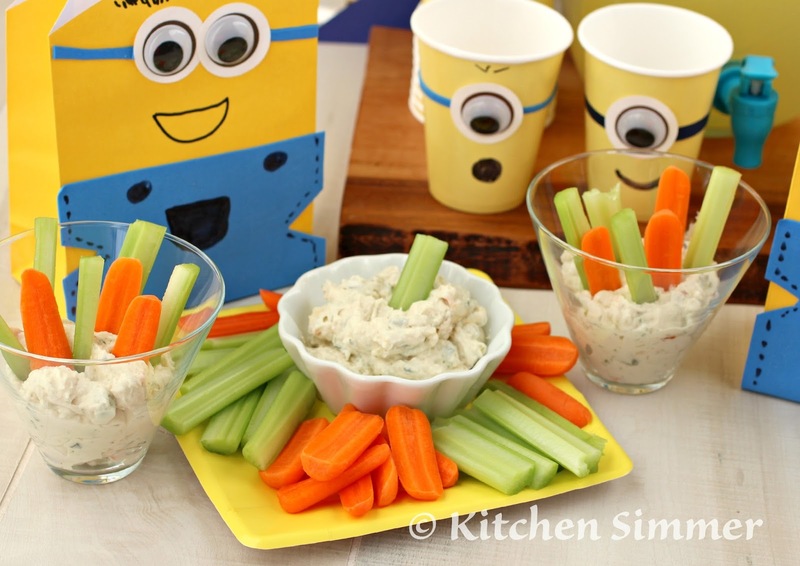 An easy veggie dip with cut vegetables was a perfect addition to our party. It also takes no time to prepare since I like to make my dip the night before to really develop all the flavors. When I make a veggie dip like this for everyone, I like to make individual portions by putting some dip into a base of a cup or glass and sticking lots of veggies for dipping. Everyone gets their own portion and no one complains they didn't get their share. This way Mom also knows who ate all their veggies. Directions: Mix all ingredients together well. Refrigerate overnight and serve with veggie dippers as desired the next day. Of course we have to have a beverage for our party and my kids wanted to pick something yellow to go with our minion friends. The kids picked out lemonade. I decided to give a little sparkle with some lemon/lime soda. We also made fun minion cups to drink our Sparkling Lemonade Punch. Step 1: Use scissors or a circle punch to cut out eyes using the white and brown paper. I hope you enjoyed reading about how my family celebrated our Minions movie night. 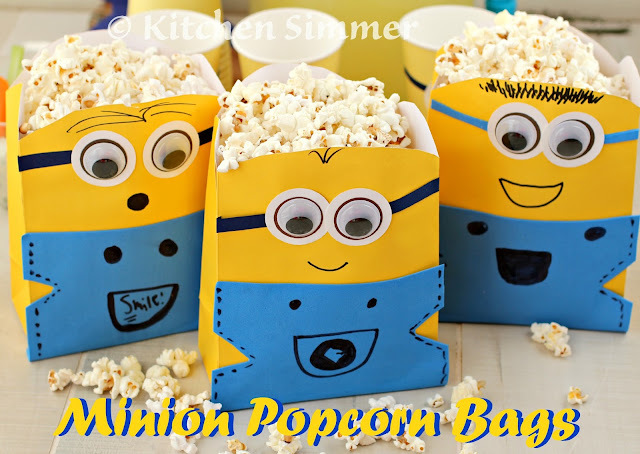 Do you need some Minions movie night inspiration? 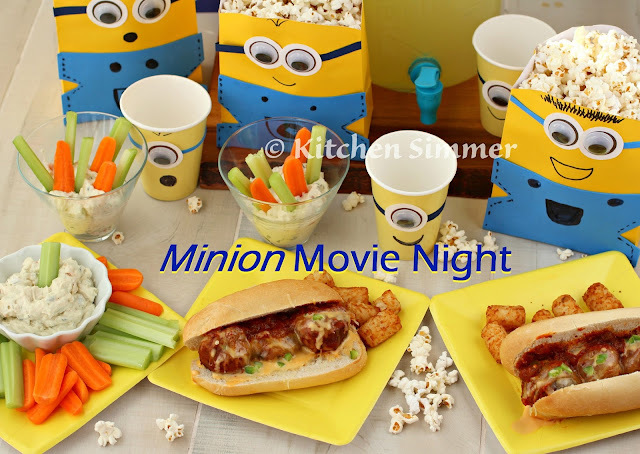 Check out this link: minionsmovienight and you will get you tons of ideas, recipes and projects to make your Minions movie night extra magical for your kids. Does your family love the minions as much as we do? Who is your favorite minion and how will you celebrate watching the Minions movie at home? Such a cute idea!! Now I want a sub for dinner! 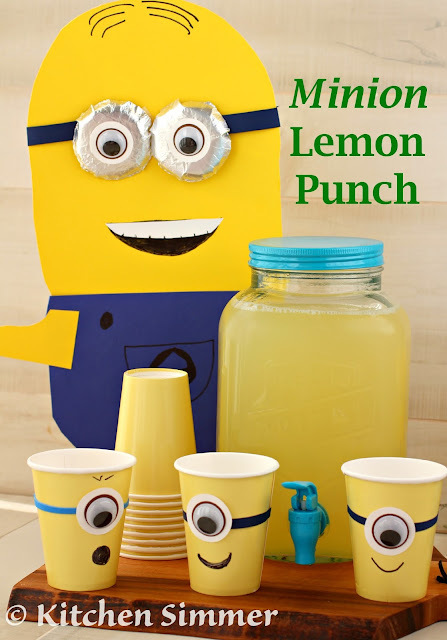 This party is such an awesome idea :D Plus I absolutely ADORE Minions!! Love this post and how creative you are! All the crafts and recipes you have mentioned are so fabulous. I can see how much fun you would have had on your movie night.